In the Sounds category, there are two main settings: adjust the volume level for all apps on your iPad and modify whether system sounds play for events such as new e-mail, calendar alerts, and keyboard clicks. Though individual applications such as Music and Videos have their own volume settings, you can set your iPad system volume as well to control the level of system sounds and sounds in apps that don’t have their own volume control. This system setting is the max against which Music volume settings work; if you set volume to 80% here, for example, Music’s 100% volume setting will actually be the maximum system volume, or 80%. You can simply press the volume rocker controls on the top-right side of your iPad (when it’s in portrait orientation) to increase or decrease volume. 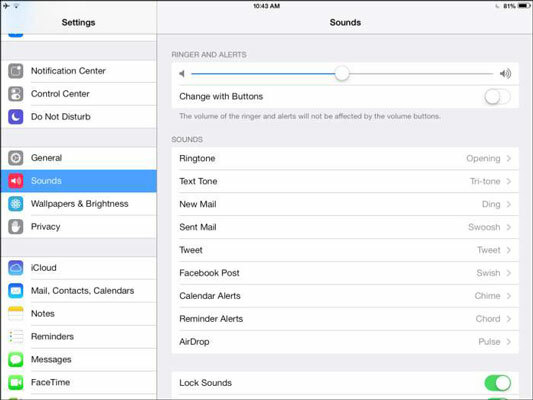 However, this doesn’t change the volume of ringers and alerts unless you change one additional setting. To adjust the system volume from the Settings pane, tap Sounds. In the Sounds pane that appears (see the figure), tap and drag the slider to the right to increase the volume or to the left to lower it. Note that you can also adjust system volume in the Control Center, which you display by swiping up from the bottom of the iPad screen. Use this familiar volume slider to adjust your system’s volume. Under General settings, make a choice from the Use Side Switch To settings to set the side switch on your iPad to mute all sounds. If you prefer to use that switch to lock screen rotation, another way to mute your iPad is to hold down the volume switch (below the side switch on the top-right corner of the device) until the sound is effectively off. This method assumes you have set this switch to control volume. To turn these off or on, or to choose different system sounds, from the Settings pane, tap Sounds and use the On/Off feature or choose a different sound for any of these. You can control the Apple Push Notification Service, used to push alerts to your Apple device, via the Notification Center item in Settings. This lets you control the alerts sent to you. You can turn alerts on and off, for example, which can save your battery life. You can also control alerts in a specific app’s settings.